The comic series Mafalda is a singular phenomenon in Latin America. It was created by the Argentine cartoonist Quino (the pseudonym of Joaquin Salvador Lavador). Mafalda first appeared in the weekly Primera Plana in 1964 and continued on various newspapers and weeklies before Quino discontinued the series in 1973. However, that did not mean the end of Mafalda. More than twenty years later, Mafalda is still immensely popular throughout Latin America through a multi-volume collection, which has gone through numerous reprints. The brilliance of Mafalda lies foremost in the quirkiness of this little girl. She hates (that is an understatement) soup, cares deeply about humanity, loves the Beatles and has a bunch of equally quirky friends (Felipe, Manolito, Susanita, Libertad, Miguilito). Just like Mafalda, the core loyal fans are significantly less probable to like soup!!! Q: Certain pseudo-scientific studies circulate on the Internet arguing that Latin American children who read Mafalda tend to hate soup. Some girls have actually been named after her. A magazine even chose her as one of the 10 most influential Argentine women of the 20th century. Isn’t this a heavy responsibility? A: Absolutely. But the real responsibility for me is facing a blank page each week on which I can say whatever I please. Someone once told me that hundreds of people would love to have their own weekly page to say whatever they liked. Becoming aware of that responsibility made me feel dizzy, but as for the rest, it’s none of my business. That certain 'pseudo-scientific study' is probably this particular one. We would point out that the study itself was conducted with all the rigor of contemporary statistical science, so there is nothing 'pseudo-scientific' about it. But even good scientific studies may be interpreted erroneously. In this case, the data indicate an interesting association between reading Mafalda and drinking soup. The data are not used to infer causality, either in the sense that reading Mafalda caused people to dislike soup, or disliking soup caused people to read Mafalda. 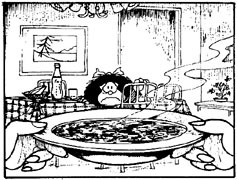 There may be other factors that underlie this association, such as Mafalda being read by people in countries or cultural groups that do not serve soup. Measures of association cannot resolve the causality question. We offer this clarification in case there is any misuderstanding. Toda Mafalda. By Joaquín Salbador Lavado (Quino), Ediciones de la Flor S.R.L. : Buenos Aires, Argentina, 1993.